Prevention covers all the measures aimed at preventing and detecting diseases early. Disorders must first be prevented from developing, or damage must be detected at an early stage. Subsequent damage and chronic diseases can be avoided by early treatment. The area of dental prevention includes all the checkups performed on infants and schoolchildren before orthodontic measures are taken; prevention can sometimes include orthodontic treatment specifically aimed at dental prevention. Dental technicians are involved in the technical process of implementing orthodontic measures. Basic dental treatment denotes all measures intended to restore and maintain dental health without prosthodontic methods. In the narrower sense, it means conservative dentistry, especially the treatment of carious, gingival, and periodontal diseases. Carious diseases are treated with fillings, which again involves dental technology. 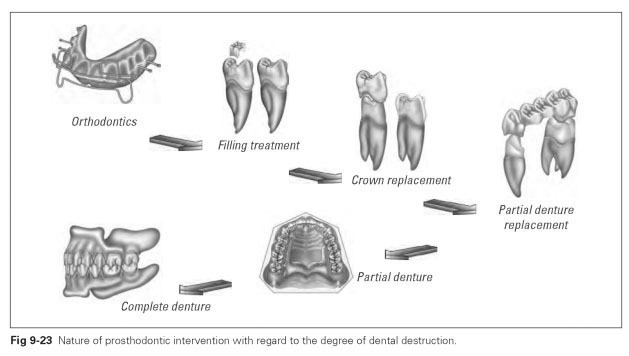 Rehabilitation by dental technology methods involves the restoration of teeth altered by disease using conservative and prosthodontic measures and taking function into consideration. 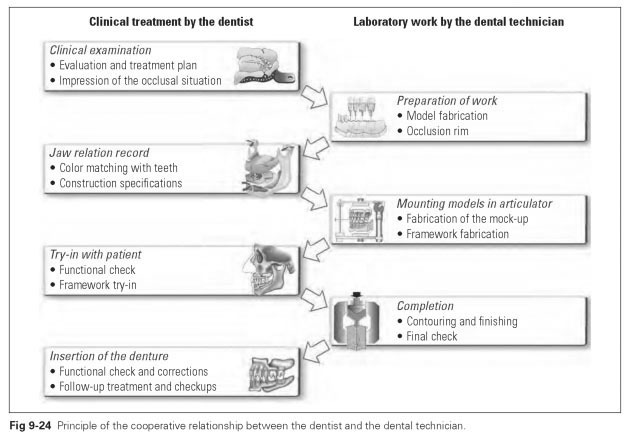 Dental technology measures are intended to arrest the pathologic changes; restore masticatory function, biostatics, and esthetics; and avoid future pathologic disorders. Pre-prosthetic measures: orthodontics, splinting treatment; surgery, periodontology; implant dentistry; interim and immediate prosthetics. Filling treatment: restoration with plastic materials or inlays. Crown replacement: partial crowns, full crowns, post crowns. This involves replacing lost dental tissue; complete replacement of function can be achieved for lifelong use. Partial denture replacement for fixed (or removable) dentures. This involves replacing dental tissue, missing teeth, and parts of the alveolar ridge; these measures do not entirely achieve complete replacement of function. Partial dentures can last up to 15 years. Partial prosthetics for removable tooth replacement. Teeth and parts of the alveolar ridge are replaced; only mediocre replacement of function or serviceability is achieved for a wearing period of about 5 years. Complete dentures for replacing all the teeth and the adjacent areas of the alveolar ridge; only limited replacement of function or serviceability is achieved for a wearing period of about 3 years. Special prosthetics: resection prosthetics and obturators. Every prosthodontic form of replacement is the result of collaboration between the dentist and the dental technician. The sequence of treatment involved in the fabrication of prostheses thus alternates between clinical and laboratory working steps (Fig 9-24). An efficient collaborative relationship depends on both partners having comparable knowledge of their shared area of expertise so that understanding can be achieved.